I love Christmas. It's pretty much the best thing ever. My brother got me Hairspray on DVD, which I kind of predicted. But the awesome thing is that he picked it out all by himself. Mary got me a Link Larkin calendar, which was probably the perfect gift. One thing that is really special that our family does is stockings. This year, since my brother won a decorated Christmas tree in the raffle at our St. Andrew banquet, we didn't take out any Christmas decorations. Our stockings this year were Target Christmas bags. But it was okay, because stockings are always the best part. We spent most of the day in our pajamas, and watched Harry Potter and the Goblet of Fire, Hairspray, Harry Potter and the Order of the Phoenix, and Underdog. I made a candy-cane cake and we had smoked goose for dinner, with Guinness. It felt very British, in a mish-mash sort of way. Last night was the liturgy for Christmas. During Advent we sang our beautiful minor settings for the liturgy. Last night we switched back to our Festal and Common time settings. 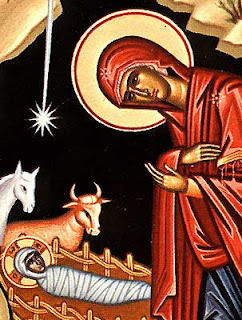 Usually on Sunday mornings, we sing this music nearly automatically, but in the middle of the night on Christmas, there is a new joy and love for it that is only topped by the Paschal liturgy. We know it so well, and it becomes such a joy to sing our beloved and familiar music. The arrangement of Justinian's hymn always gives me the chills, although I will certainly miss singing Tchiakovsky's Trisagion (Divine Liturgy of St. John Chyrsostom, Opus 41: III). This past weekend, I went to see Sweeney Todd twice. The first time I saw it, I was a kind of ambivalent. The second time, though, I really liked it. I was able to pay attention to the music more (the music is genius) and to catch the nuances of the story. It's a sad story of how vengeance can ruin everything. I thought of it like a modernized Greek tragedy--definitely Aeschylean. I was most interested in the character of Mrs. Lovett. I adore the music for her, but besides that, her devotion to Sweeney is just as destructive as his hatred and vengeance. She really wants to be a family with Sweeney and the little boy ("Buy Pirelli's Miracle Elixir! Nothing gets it quicker! True, sir true! "), but even though it is real in her mind, their 'family' is really just a sham. The destruction of the relationships between the three of them is mostly her own fault apart from Sweeney's murderous thirst for revenge. Anyways, Now that I am almost 1 week away from OXFORD, there is much to be done. Namely packing. If anyone has good packing tips, I would love to hear them. I have a rucksack for backpacking during the trip, which is good. I am so excited. Yay! I'm glad you arrived safely, got business class (WOO), etc.! Keep up on the blog, dear Erin, or I will have to cause you Grave Harm. Also, Cranmer and Latimer are indeed holy martyrs, thank you very much, even if you don't agree with the particulars of their cause: they were killed for their Christian faith--defective as it may have been, not unlike all other sinners--and we ought to honour them and praise God for them.